The Green Peafowl has the largest wingspan of any galliforme bird. 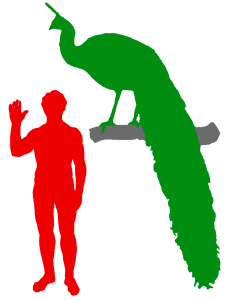 The male grows up to 3 metres (10 feet) long, including the train – its long tail feathers – and it weighs up to 5kg (11 lbs). The female is 1.1 m (3.5ft) long and weighs about 2.4kg (5lbs). It has a large wingspan of about 1.2m (4ft). It is able to fly long distances. It can be found in the tropical forests of South East Asia, for example, in Malaysia and Java. It is closely related to the Indian Peafowl or Blue Peafowl which can be found in India. 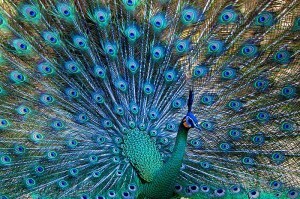 As for their blue cousins, the male Green Peafowl are called Peacocks, and the females are called Peahens. The male Green Peafowl is brighter in colour than the female Green Peafowl. The females look duller and lack a triangle of green feathers at the wing shoulder. She has blackish-brown underparts and a tail with pale wavy lines on it. The males has long, upright crest, bright glossy-green feathers with blackish scales and blackish-brown wings. Both males and females have tail pointed crests, long legs, and have heavy wings and long tails. The females nest on the ground and lay between 3 to 5 eggs each time. It is the mother who takes full responsibility to care for her chicks. They usually spend time on or near land with tall grasses. They will rest in trees which are as high as 10 to 15m (33-50 feet). The males will call from their resting place at dawn and dusk. They eat fruits, invertebrates, reptiles and other small animals. They are even capable of hunting poisonous snakes. So, it is good to have one of them in your backyard to keep the snakes away! Ticks, termites, flower petals, buds leaves and berries are also favourite foods of the adult Green Peafowl. Their predators are the Clouded Leopard, the Jungle Cat and the Fishing Cat. The Green Peafowl is an endangered species because a lot of people have hunted them for their meat and feathers, their eggs and chicks, and also because their habitat is reduced. Sadly, it is regarded as a pest by farmers in China and Thailand, so they try to poison it.